There is NOTHING like trying out a new DIY hair serum, especially one that works to encourage hair growth! Those with fine, barely there hair that would like to grow their hair, can benefit from this coconut oil & aloe vera DIY hair growth serum as it promotes quick hair growth. Aside from that, it also nourishes dry hair and scalp and pumps each hair follicle with proteins and vitamins to add shine, volume, and fix split ends. Apply to dry, unwashed hair and leave on for at least 2 hours or overnight. If you leave it on overnight, make sure to slip on a shower cap as not to stain your pillows! Use 2-3 times a week to encourage hair growth, fix split ends, and eliminate fizz. 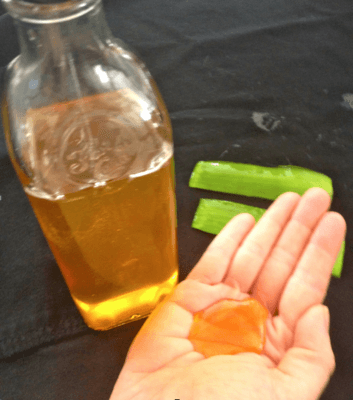 Aloe vera gel is a natural ingredient that is anti-bacterial and deep cleansing, therefore curing any scalp problems that may prevent hair growth. Aloe vera gel also contains a ton of vitamins and minerals that go deep into the hair follicles to seal in moisture and prevent split ends. Coconut oil is packed full of fatty acids and proteins which nourish dry, brittle, and breaking hair. Each strand gets a big dose of these fatty acids and proteins to protect and heal hair that grows slowly. Honey is also anti-bacterial and anti-septic, and therefore great for the scalp. Honey is also a deep cleanser and a moisturizer too! Vitamin E oil nourishes dry, breaking hair, and also eliminates frizz. Where can I purchase vitamin E oil from plz? Marie-Claire, you should be able to find vitamin E almost anywhere 🙂 Check your local drug store, grocery store, health store, beauty store, or online such as on Amazon!